A tumor of the body can strike unexpectedly. In my case, that time was back in the fall of 1995. I started Purdue University as a freshman-engineering student. I was slowly developing balance problems as the semester progressed. By October, I noticed the balance issue, and went to the student health center; because I thought I might have ruptured my eardrum. The doctor told me that my eardrum was fine, but I was just stressed. This made sense to me, being on my own for the first time in my life. I took a few classes off, but still was having balance problems, so returned to the health center. This time, the doctor said it was probably stress, but if the problem did not go away, he would recommend a neurologist. I relayed that message to my mother in Indianapolis, who immediately told me to return home to Indianapolis. The next day, my father arranged for a neurologist to see me in the Emergency Room of a local hospital in Indianapolis. After a thorough examination, I was given the first of over 30 MRI's. The scan revealed two tumors; one on the cerebellum, and one in the brainstem. Surgery was done on the cerebellar tumor, with the surgeon removing 100 percent of the tumor. The tumors, although non-cancerous, were slowly getting bigger, causing pressure on the brain. After we found out that the tumor, a Juvenile Pilocytic Astrocytoma (JPA), was slow-growing, my neurologist in Indianapolis wanted to use radiation therapy to attack the brainstem tumor. He felt that performing surgery in the brainstem was too risky. My sister's friend commented to her that she recalled reading in Reader's Digest about a doctor in New York City who performed surgery in the brainstem. My father was able to contact Reader's Digest, and get the name of Dr. Fred Epstein. Fred read my MRI scans, and said he would be able to remove between 60-80% of the tumor. After some discussion with local doctors, my parents and I traveled to New York City in January, 1996. Fred was able to remove about 70% of the tumor. Again, the tumor pathology was determined to be another JPA. After a 6–week stay in the hospital due to some post-op problems (bacterial infection, blood clot to the lungs) I was able to return to Indianapolis for rehabilitation, which included relearning how to walk again and how to use the right side of my body. I was able to return to Purdue University in the spring of 1997. I switched majors to biology, then to Pharmacy towards the end of the semester. I spent the next two years immersed in the study to be a Pharmacist. Over Spring Break of 1999, I asked my doctor for an MRI, because during the first half of the semester, I observed some nauseousness while taking notes (constant looking up at an overhead projector, then down to my notebook.) Even though the scan indicated new growth, I opted to return to Purdue to finish the semester. I had another scan two weeks before the end of the semester, which showed further growth of the tumor. My neurologist told me to start radiation therapy the next day. I dropped out of Purdue, and returned to Indianapolis. After 22 of 26 radiation treatments, an MRI was performed which showed that the radiation was not effective, and surgery was done. This time, doctors in Indianapolis were able to perform brainstem surgery. On May 28, 1999, I had my third brain surgery. The Indianapolis surgeon (Dr. David Hall) was able to successfully remove 100 percent of the tumor. 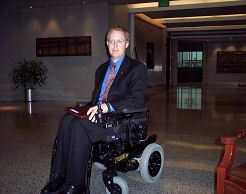 I again went through months of rehabilitation, and returned to Purdue in the spring of 2000. My balance has not recovered, unfortunately, and now use a walker/manual wheelchair/motorized scooter/motorized wheelchair for mobility. I switched my major to Organizational Leadership and Supervision (OLS). I graduated with a Bachelor of Science degree in OLS on December 19, 2004. Currently, I play Power (wheelchair) Soccer for the RHI Inferno. I live with my parents in Indianapolis, and receive Social Security for Disabled Individuals (SSDI). Send a message to Scott!